It may be a product of growing up in California with California Pizza Kitchen, but I'm a sucker for non-traditional pizza ingredients. Whether you call it flatbread, pizza or crostini, if it involves dough, cheese and off-base ingredients, I'm there. I can still remember my first meal at a California Pizza Kitchen. It was sometime in the eighties at the (original?) location in Brentwood. My Aunt Linda had taken my brother and I off my parents' hands for a night and was taking us to this cool, new restaurant. We decided on a BLT pizza, but then tried to confuse the waiter by adding in a few more letters for ingredients we wanted to throw into the mix. Not only were they going to bring us a BLT pizza complete with mayonnaise dressing on the lettuce, but they were going to throw in some avocado and other toppings we had requested. I was sold. To this day, I love dressing up quick tortilla pizzas with unique ingredients. My current favorite is sweet corn. It gives you that wonderful sweet/savory thing going on with the pizza and the tortillas are easy to keep on hand and require no pre-baking. Talk about a quick dinner? This is it. Spread 1/4 cup marinara and 2 T cheese over each tortilla. Divide shredded chicken and corn between each tortilla and top with remaining cheese, 1/4 cup for each tortilla. Place under the broiler for five minutes until starting to brown on top. Cut into wedges and enjoy! I love that you made this with tortillas. I would have never thought to put corn on pizza. YUM! Sounds and looks incredible! I love sweet corn and think it tastes good as an add in for so many meals! I have never been to a real california pizza kitchen! I've only been to like the mini ones at the airport and I don't think that counts! Using tortillas as the pizza crust is a terrific idea. How quick and easy is that! 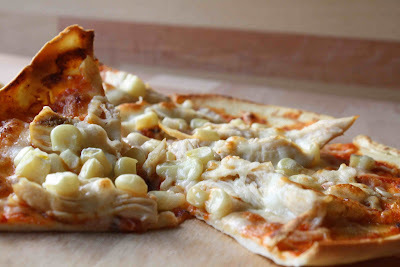 When I lived overseas sweet corn and tuna pizzas were very popular. I wouldn't eat them at first, thinking that the combination would taste terrible. After trying it, I loved it. I'm all for alternative pizza toppings. Back home a local pizza joint was famous for it's mashed potato pizza. We couldn't get enough of the stuff. i saw that pizza place on food network! i wish i could go there someday. this pizza looks damn good. i love me some good corn. You are my first featured blogger! The crust on that pizza looks so good! I wish I hadn't found all of these food blogs with the great-looking items on them. I had a measly little leftover hamburger patty and two baby dill pickles for supper. Oh, well. Back to my giveaway blog. i have a similar recipe like this that i have been wanting to try out...this looks delicious! Nice looking pizza! I like the use of the sweet corn on it!